The third stage of the International student practice was started on Monday, 9 September 2013 in the JINR University Centre. 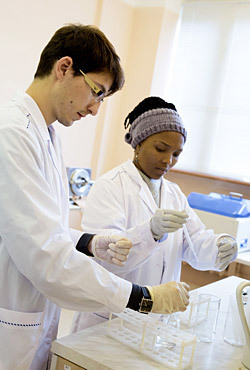 Students from the Republic of South Africa and the Republic of Belarus came to Dubna. During three weeks students will attend lectures on research fields of all of JINR laboratories and will work on their study research projects. As always, students choose topics of their study projects on their own. This time almost a half of 41 students chose themes of FLNR, the rest of them will work on projects proposed by laboratories of neutron physics, theoretical physics, radiation biology and nuclear problems. – Our international student practice begins in the middle of May and continues to September – UC Director S.Z. Pakulyak said. – It is already the seventh practice at the Joint Institute for students from the RSA, and it is the second year when students from Belarus joined them. Students come here, first of all, to get acquainted with JINR and, secondly, to perform small study research projects, in implementation of which they can feel in a modern scientific team. We try to organize these practices in the way to make students come back to the Institute and work in research groups as researchers. This could be difficult without preliminary acquaintance with JINR. First, students attend lectures, then they start to work on research projects, and there are always projects which engage students of both countries. As a result, they get not only scientific knowledge, but also the general culture knowledge. This year a trip to St. Petersburg was planned for students from the RSA, and a lecture on the history and culture of Russia was also planned at their request; the lecture will be performed by UC employee historian Tatiana Strokovskaya. In my opinion, it is very important for students from the RSA to feel that they can come and they have to come here to work.